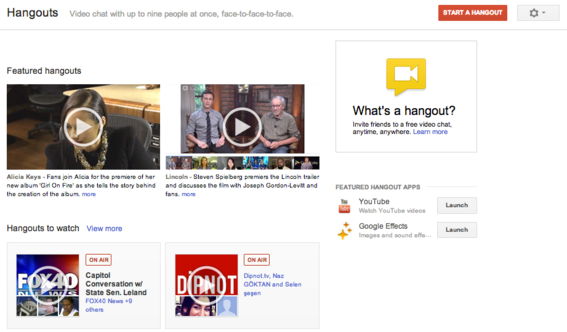 Hangouts is a popular component in the Google+ platform. Hangouts enables live video chats with up to 10 people using Google+, your website, and mobile apps for Android and iPhone. Hangouts also offers productivity features such as screen sharing and collaboration via access to Google Drive. In addition, Hangouts is integrated with Google Calendar. Users can add hangouts to calendar events and join Hangouts directly from the calendar event or event reminder. One possible drawback to using Hangouts is that participants have to be invited to attend. Each participant will receive an invitation letting him know he has have been asked to join. Using Hangouts requires a few simple steps. 1. Go to your Google+ Page and click the “More” option located in the left-hand column, then click “Hangouts.” You will be taken to the Hangouts page. 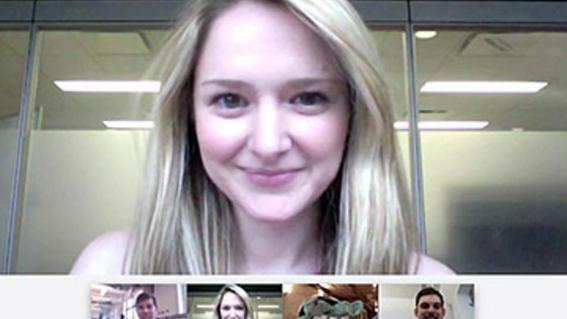 Click "Start a Hangout" to initiate a live video session. 2. Click the red “Start a Hangout” button located in the upper right-hand corner. This opens the Hangouts dialog box, where you will be asked to do the following. Add names of individuals, Google+ circles, or email addresses. You can add participants via telephone, but they will be limited to voice access only. Enable Hangouts On Air, if desired. Name the Hangout and invite up to 10 attendees. 3. Click the blue “Hangout” button to begin the session. After a short countdown, your Hangout will start broadcasting on your Google+ profile, your YouTube channel — if Hangouts On Air is selected — and on any website where you’ve embedded it. Hangouts can be live-streamed via Google+, YouTube, or a website. Hangouts includes several settings that extend its capabilities and enhance the user experience. Chat. Chat with people in the hangout using text. Screenshare. Share your desktop with others in the hangout. Control Camera. Control how and when each participant is shown in your broadcast. Google Effects. Add silly features, such as facial hair, glasses and other layered effects, which is good for personal use, but probably not for business. Google Drive. Share documents or create a document collaboratively. Hangout Toolbox. This toolbox provides several extensions to improve your Hangout experience, such as titling options for use with each participant, volume controls, sound effects, and comment tracking. Hangouts On Air is a built-in feature for hangouts to live-stream your Hangout within Google+ and on YouTube where it will be recorded for later on-demand viewing. The recorded video will be available on your YouTube Account after the Hangout ends. You can broadcast your live Hangout On Air via Google+, your YouTube channel, and your website. Then, you can share the public recording once it’s completed. Every Hangout On Air is automatically saved to your YouTube account, so no additional steps are required to upload it. Google requires you to have a verified YouTube account and, when the Hangouts On Air option is selected, takes you through a two-step verification process to ensure that your account is verified. Google+ Hangouts offers benefits to merchants who wish to use its live conferencing capabilities for customer service, product demos, video blogging, or other uses. It is easy to set up, features an attractive user interface, and is web-based so no downloads are required. Sessions can be live-streamed via Google+, YouTube, and embedded on websites. Hangouts can also be recorded for on-demand viewing at a later time. Its screen sharing and collaborative features make it an alternative to Skype, Go To Meeting, or similar screen sharing platforms.